Your vacation object: The holiday house is placed on a 350 sqm and an enclosed property. The property is enclosed with a fence. The landlord does not live in the house or on the property. Relax outdoor at the terrace with pavilon, parasol, sunlounger and garden furniture. The playground with swing, sandpit and climbing scaffold makes children's hearts beat faster. Barbecue possibilities are available. The campfire place promises romantic evenings. The building is a pleasant outdoor patio furniture with fireplace and barbecue, two covered and illuminated wooden shelters, children's playground with sandbox. Your fitness, you can keep busy with 5 bicycles and. Your holiday house: Your holiday house consists of 2 floors, 3 rooms (from which 2 bedrooms), is 60 sqm and can accommodate up to 7 persons. Smoking is not permitted inside the rooms. On colder days your holiday house can be heated with electric heating. fireplace The entrance leads over a terrace. The rooms are divided as follows: Living room with fireplace, lounge, dinette, TV, DVD, stereo system and radio. The dinette offers space for 6 persons. You have access with 1 table and 6 chairs. Cooking nook with dinette, TV, electric cooker (4 plates), refrigerator (freezer), microwave, coffee machine, toaster, electric water boiler and washing machine. The dinette offers space for 6 persons. Bathroom with shower, 1 washbasin and WC. Bedroom with 2 double beds and dinette. You have access to the balcony. Bedroom with 1 double bed and 1 single bed and dinette. In addition, your holiday house is equipped with WLAN- internet access, baby bed, high chair for children and washing machine. TV or radio channel can be received per satellite. Pets: erlaubt. Gratis. Den Kamin fand ich besonders schön. Die Beschreibung stimmt mit den örtlichen Gegebenheiten überein. Die Familie Rousek ist hilfsbereit ohne aufdringlich zu sein. Der Standort selbst ist ruhig und sehr gut als Ausgangspunkt für Ausflüge geeignet. 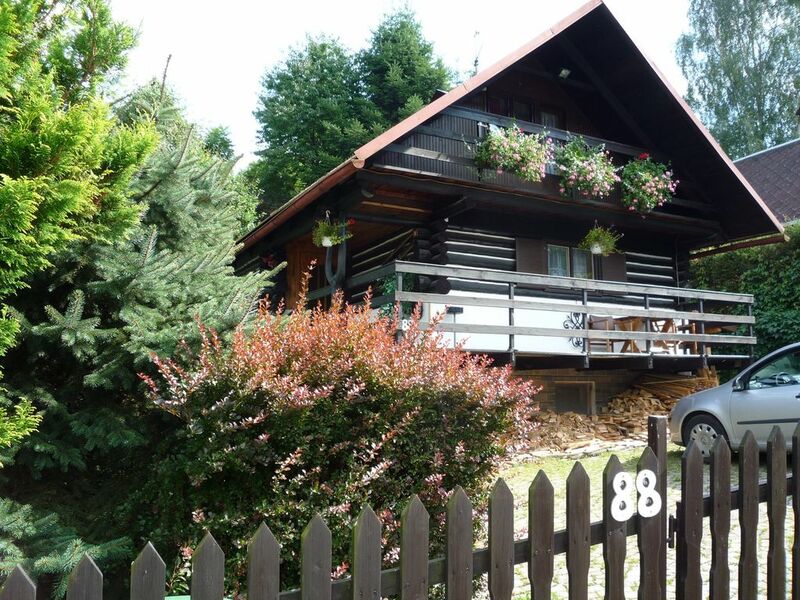 Wir waren als 2 Ehepaare(56 -62 Jahre) für 2 Wochen da und möchten dieses gemütliche Ferienhaus weiterempfehlen. Die Gastfamilie hat uns sehr freundlich empfangen. Die Unterkunft war sauber und ordentlich. Sehr Saubere und Gemütliche Haus. Sehr(über) Ruhige Lage und Nachbarschaft. Perfeckter Platz(Einkauf-mögligkeit ohne ende("Lidl","Albert","Kaufland")....,alles in Paar kilometer). Also Alles war einfach SUPER!! obiekt cudowny okolica wspaniala cicha mozna doskonale wypoczac,polecam wszystkim Odpowiedz właściciel/biuro: Budynek jest gotowy dla wszystkich gości czyste, wnętrza i wyposażenie opisane, pierwsze piętro - sypialnie są w pełni odbudowany.